Israel responds to Hamas use of helium gas meant for Gaza hospitals to use in balloon attacks on Israel. Following the directive of Defense Minester Avigdor Liberman, the Coordinator of Government Activities in the Territories, Major General Kamil Abu Rokon, today ordered the restriction of the entry of helium gas into the Gaza Strip. 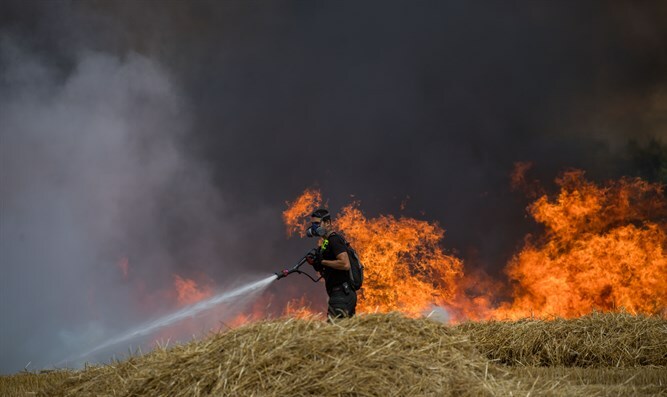 The step was taken in response to the use of helium balloons by terrorists in the Gaza Strip to set fire to Israeli fields by attaching incendiary devices to the balloons. Maj. Gen. Rokon stated that if the terrorist groups in Gaza continue to use helium gas to attack Israeli territory, then the IDF would ban all supply of helium to the strip. "The Hamas terrorist organization does not hesitate to take measures, including exploiting the humanitarian channels and means to carry out terrorist acts, despite Israel's efforts to prevent a civil deterioration in the Gaza Strip and the provision of humanitarian needs," he said. Earlier, Defense Minister Liberman accused Hamas of diverting helium from Gazan hospitals for use in the incendiary balloons. "The helium we supply to hospitals, medical equipment, mainly for MRIs - instead of this helium going to those patients who need MRIs, they use it [for these weaponized balloons] and ignite fields here in the south."